The concept of providing shelter to the gypsies is not new in India. Establishments like Dharamshalas and Viharas has been regarded as the home to all the travelers during the ancient time which still continues. However it was Late Pandit Jawaharlal Nehru, then Prime Minister of India who after his return from Non-Aligned Movement Conference in 1956 recognized that hospitality and tourism could be a fuel to the engine of the country's economic growth. This ushered the first ever government investment in the hotel industry with the initiation of the Ashoka Hotel in New Delhi. Followed by this The India Tourism Development Corporation (ITDC) was set up in 1966 and in 1967 government stepped forward and created the Ministry of Tourism and Civil Aviation, separating it from the Ministry of Transport and Shipping. This moves by the government instigated the then business tycoons to begin methodical planning, designing, decorating, and furnishing of ace hotels in major cities. Gradually getting motivated by the success stories of hotels in metro cities, industrialists' started to build hotels in secondary cities. Over the years, the hospitality industry has seen a stupendous boom, the credit of which largely goes to the 'Incredible India' campaign. The market size of the tourism and hospitality industry in India stood at US$ 117.7 billion in 2011 and is anticipated to touch US$ 418.9 billion by 2022. According to Planning Commission data, the Hospitality sector is the second largest employer in the country after Information Technology sector and is capable of offering employment opportunities to professional executives in the country. Now the training of managerial and other top-ranked personnel in the hotel industry is considered to be a beneficial factor for the future upliftment of the industry. Hospitality education being a highly job oriented field mesmerize the interest of more and more students towards opting for this career path. Hotel management jobs include multiple skills like food and beverage service, front office operation, sales and marketing, accounting and so on. With the growing demand of hospitality sector in India, the opportunities for hotel management graduates are increasing with each passing day. In order to perform well in the ever-changing hospitality business environment, aspirants require a certain operational and managerial skills. 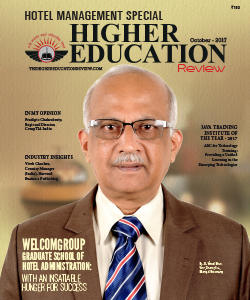 And thus, to supply efficient human resource for the industry, massive numbers of hospitality educational institutions in the country are cropping up with a variety of hospitality management education programs. Anyhow, identifying a hospitality college which holds the commitment of providing a right blend of practical and theoretical knowledge is not plain sailing for the young students. It demands a lot of exploration and fact-finding in pursuance of deciding the same. 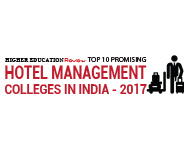 Hence, we at Higher Education Review have listed 'Top 10 Promising Hotel Management Institutes in India 2017' for simplifying the hurdles encountered by the budding hotel management professionals. Amity School of Hospitality Noida, Uttar Pradesh The institute is preparing dedicated industry professionals capable of meeting challenges of dynamic needs of the hospitality industry. Dr. D. Y. Patil Institute of Hotel Management & Catering Technology Pimpri-Chinchwad, Maharashtra An institute nurturing skill and talent in the students to bring about holistic development to occupy key positions in the hospitality industry globally. Faculty of Hospitality, GNA University Phagwara, Punjab An institute delivering quality education in keeping with the International Hospitality and Tourism industry standards meeting the challenges of Industry. GEMS Hotel Management Institute Bengaluru, Karnataka The institute is conceived by accomplished professionals with an exclusive purpose of igniting excellence among the young minds. ICE College of Hotel Management and Catering Technology Mumbai, Maharashtra An institute with a mission of encouraging students to critically reflect on theoretical and practical approaches to behavior, work and organization in the Hospitality Industry. Jayaram College of Hotel Management and Catering Technology (Jchm) Madurai, Tamil Nadu A pioneer professional college where students gain valuable practical experience to become successful in their future endeavors. Maagna College of Hotel Management and Tourism Karimnagar, Telangana A premier educational institution nurturing students to make effective contribution to the society in a dynamic environment. Munnar Catering College Munnar, Kerala The institute inspires youngsters to acquire a quality and confidence required to understand and solve problems in dayto day operations. NIPS School of Hotel Management Kolkata, West Bengal An institute with unique schooling pedagogy to develop the student career to a level achieving a cosmopolitan experience for the future career success. Welcomgroup Graduate School of Hotel Administration Manipal, Karnataka An institute dedicated to excellence in teaching, learning and research to develop professionals making a difference globally.